Grow Old with Grace: Rat-a-Tat-Tat...I Hear Spring! 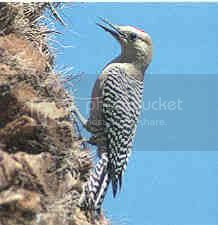 Lately, I have heard a Gila Woodpecker pecking on metal in the neighborhood. He seems to like street lights, swamp coolers, trim on houses, anything that makes noise so he can impress the ladies. That is one of the first signs of Spring around these parts. This morning while I was out in the yard with the dogs, I heard another tapping...this time it was Mrs. Gila Woodpecker remodeling her nest from last year. It is in one of our poplar trees that is mostly dead. She made a perfectly round hole in the trunk and hollowed it out. Last year we could see two little heads pop up every once in a while. I am happy to see she is returning. Haha...they can be a nuisance, but I love to watch them. I have one that comes around every spring too. But he pecks on the spark arrester for my chimney and the sound goes throughout my entire house. Not looking forward to it. I am looking forward to spring though! Sandy - They like the metal things around here and it echoes through the culdesac! Bet the lady birds love it, though! Woodpeckers are so much cuter to look at than they are to hear - especially in the wee hours of morning! Kathryn, you are so right! Noisy, they are! If it isn't winter, it's my favorite time of year! I have all kinds of woodpeckers in my Bosque' home. There are those that spend the warmer months with me and those who spend the winter. Those who spend winter, I know as Rocky Mountain Wood Peckers, and they are very large and not very smart. When they arrived this winter, I had to close all of the blinds and curtains in my home because they were trying to fly through the windows. It was something like the old Hitchcock movie, "The Birds". They are still here roosting in the rafters of my front porch and trying to nest in my husbands pole barn and making quite a mess and drilling holes in anything made of wood. I'll be glad when they move on and the little ones that look like Woody appear! Yes, I'm very ready for Spring! Pam - Ha! Winter isn't my favorite either, unless I am in Colorado or Utah at that time of year. Yep...woodpeckers do wreak havoc with their pecking, I agree. I still love to watch them, though. Thank you, Nancy! I look forward to your visits here and I'll be sure to check in on you, too! Love your blog, Nancy! Thanks! Bailey, thanks for following and taking a minute to leave a hug...er, comment!